“I can’t. Sorry.”After so many years of saying yes, I’d gotten really good at saying no. At being protective of my time. I told myself that I was protecting my family time. Evenings are for family dinners. Bedtime reading. Prayers. It was ok with me to miss one night, but multiple? Nope. I have to draw the line somewhere and after too many weeks where I felt like I was a ship, passing in the night – I needed to be home. Until one day when I realized that the family time I was so protective of, wasn’t actually family time. Yes, we were together at the dinner table. But once the meal was over, the puppy needed to be walked, homework needed to be finished, laundry folded. I’m not knocking family time. It is crucial and as the mom of a middle schooler, I want to hold on to the moments where my teenager still enjoys bedtime reading together. But, it hit me. What if family time didn’t have to look a certain way? What if it was more about intention and showing up even in small moments, to be present with one another? What if this sacred time that I was protecting, wasn’t as sacred as the energy that we bring to the time? What if all the stories we have about not having enough time for whatever it is we want or think we need to do could be re-explored with the lens of purpose first? I realized that it isn't about protective of my time at all. But all about being intentional. Knowing my WHY and making choices that nurture and nourish the inner parts of me first. Maybe I say yes. Maybe I say no. But I make the choice with my values and my intention as a barometer instead of a perceived amount of time on a clock. Maybe I don’t need 3 hours of family time (especially when most of that physical time is spent in different rooms). Maybe the same fulfillment and connection could come from showing up without any distractions (aka devices) for a shared moment that could happen anywhere. It occurred to me that the stories I was telling myself don’t just apply to family time. Me time. Work time. What if all the shoulds and to-do items could come after a newly prioritized plan to nourish your heart first? So many of us use clocks as measures of progress. How long can I meditate? Can I beat my 5k pace? How many clients can I fit into one day? How long did I spend with my kids? But what would happen if we used our heart as a gauge for fulfillment as the ultimate measure of time? I’ll tell you what happens. Or at least what happened to me. I started doing things like taking time to color before diving into my email inbox. Or going for a short walk in nature even when I have things to do and places to be. Or telling my family that I needed 20 minutes for a yoga practice before dinner, and could they please take care of the puppy and setting the table. I even took 35 minutes one morning to clean out a desk drawer that had become a repository of old business cards, not-working pens, and thumbtacks. I eventually make my way back to my to-do lists and “work.” But with each choice to nourish first, I cultivate a new sense of energy and clarity. It is as if I'm literally filling up my own gas tank. And as it turns out, I show up for myself and for others with more space and more compassion. And guess what? Time feels more abundant than scarce. Time feels like an opportunity. A choice. It isn’t that I don’t get overwhelmed at times. I do. But in that moment that I catch myself after going down the rabbit hole of frenzied actions, I stop. I take 3 breaths. I say, “I forgive you” to myself. And then I consider: how is the frenzy serving me? (Hint: It rarely does.) And finally, I ask myself: What would feel nourishing? And I do that. Even just for 2 minutes. Because here is the good news about time...each new moment offers a new opportunity to be present. To discern based on your values and your intentions. To cultivate your superpower. To choose to lead with love and abundance instead of fear and scarcity. 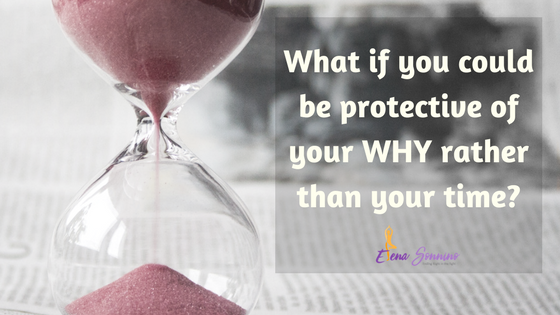 So...are you ready to be protective of your why instead of your time? Want to de-clutter the things that are keeping you small so that you can find more clarity about your WHY? Learn more about See you. Be You. - a retreat and small-group coaching program!